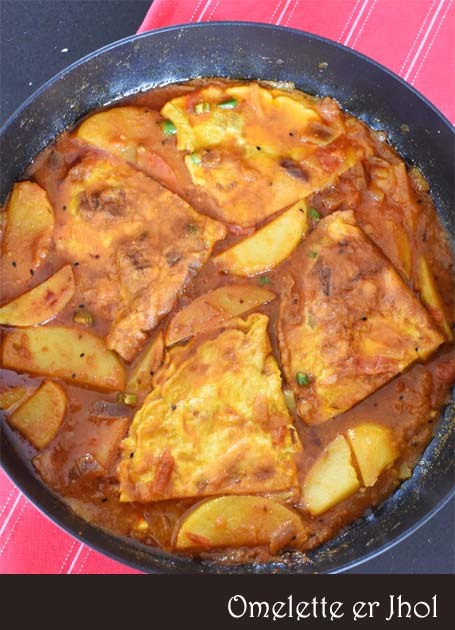 This Omelette er jhol or Indian style Omelettes in a gravy, is one of my favorite egg dishes. There is something about an omelette basking in a thin curry and growing fat and pillowy, all so that you can bite into its softness and let the curry juice trickle down your throat. It makes an omelette far more sensuous than an omelette. I don't know if anywhere other than in a Bengali home, an omelette is dunked into a gravy. Why you might ask ? I mean why can't you just eat an omelette like it is destined to be eaten? For we like to change destiny, I say. For we see rainbow where you might just see a blue sky with white clouds. Nothing wrong with a blue sky and white clouds. But a rainbow adds magic. Just like the omellette in a jhol. 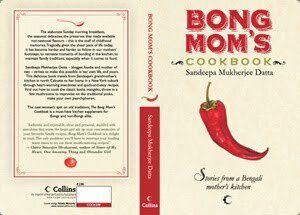 Now, there are many Bengali homes too where this dish is not the norm, like this dish was never made at my in-law's home and when I made it for the first time, they thought it was some crazy idea of mine. But my Ma, has been making this for ages and I have always loved this slightly runny jhol with its potatoes and soft omelettes. Big Sis loves it much more than the regular egg curry aka dim er jhol and asks for it often. It is pretty simple to make too. Rice and omelette er jhol makes for a very comforting dinner for us. First take 4 large eggs. Or more eggs if you so wish. Let us not even go into the conundrum of which comes first "Chicken or the Egg"
Now comes the difficult part. Break the eggs in a bowl, two at a time. Now make an Omelette. Heat oil in a frying pan. Pour out the egg batter on the pan and swirl till the batter is evenly distributed and let it cook. 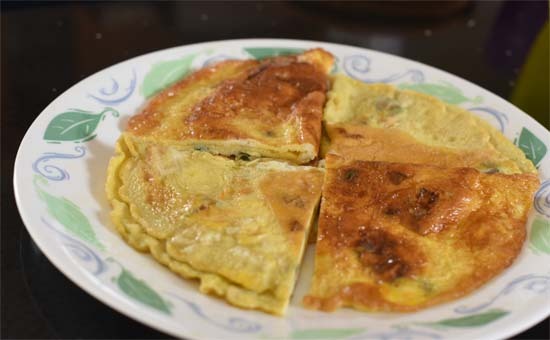 Fold the omelette in half and cook both sides. Slide it out on a plate. When cool slice in two portions. You can also slice up in cubes or squares. Making the thin gravy for Omlette er Jhol. You can make a richer and thicker gravy if you so wish but we like a thin gravy. When the seeds pop add half of a medium onion chopped fine + 2 green chillies slit along the length. Saute till onion softens. Toss in 1 potato cut in thin half moon shapes. 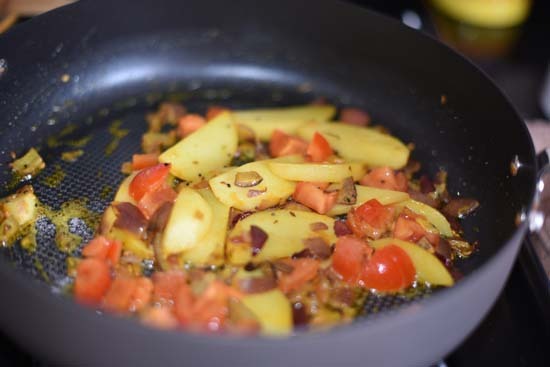 With a sprinkle of turmeric powder, fry the potatoes and onion until they turn golden. At this point the fried flavor of onion and potatoes will make you very hungry! Next add a chopped tomato. Add about 1/2 tsp of ginger paste. Fry for a couple of minutes. Tomato should be totally mushed up by now. Add this masala paste to the potatoes in the kadhai and cook at low heat for 4-5 minutes. Add about 2 cups of warm water, salt to taste and mix well. Let the gravy come to a simmer. Cover and let the potatoes cook. Once the potatoes are done, taste the curry and adjust for spices. You might like to add a little sugar to the jhol at this point. Once the jhol/gravy is ready add the the omelette into the gravy and let it simmer for 3-4 minutes. Yesterday was the dress rehearsal at LS's dance class. Being an Indian classical dance you can well imagine the lengths one had to go to, getting the child dressed. But this post is not about the dance so let us not deviate. I usually drop Little Sis off at her dance class and come back to pick only later. Yesterday however I had to stay back to check with the teacher if the dress and get up was okay or anything more was to be done. The place was full of little girls all in traditional costume and their Moms. Mostly the parent/guardian was female so I assume it was the Mother except for one whose Dad was there. Now on other days I see many Dads doing the drop off and pick up but yesterday it was mostly Mothers. I guess it was because they were in charge of the costume and make up for the child. Now this particular Dad who was there yesterday wasn't just doing a drop off. He had come armed with full knowledge of what his daughter's dress and makeup should be and was not afraid to ask questions. His daughter, a little girl of probably eight was beautifully dressed but was missing a couple of fake jewellery.There were a few other kids who were missing the same. The teacher handed them the pieces and said it has to be secured with safety pins. Most of the Moms were clueless and did not have any safety pin on them. I myself had just bought a box of safety pins the day before and the box was tucked away at home.As we were looking around, this particular gentleman fished out a box of safety pins from his bag and fixed his daughter's jewellery. He then also took out some bobby pins and fixed her hair. When all was done, he shared a few of the safety pins with us too. I was really amazed at how well prepared and organized he was compared to moi. Maybe it his wife who had packed the bag, maybe it was his super organized nature but he seemed like a pretty good Dad to me. The resident Dad is an all rounder and I often get to hear how my life is extremely easy as the Dad chips in.I am happy to see that there are more of his kind. The school is wrapping up for the year and there are too many things going on. The middle schooler had her auditions for the school choir and band, and for two whole weeks the house reverberated with sounds of clarinet, piano and singing. Looked like the entire year of practice to be done at home, was crammed into the last two weeks of school. After several nail biting days of audition, first callbacks and waiting, finally the list was up. Big Sis was too happy to be selected for the school show choir and also got a chance in her school jazz band. She decided to go with the choir though and is already looking forward to the inter school competition at Hershey Park next year. There is also music(vocal) and piano recitals as the year ends and honestly all this is too much of "kaalchar" for me. The one recital that has me the most stressed though is Little Sis's dance recital next week. This is LS's first year of BharataNatyam lessons and the dance school has a full fledged show to mark the year end. All these months LS has been dancing to glory in her shorts and tees and doing her aramandis and mudras with perfect comfort. Unlike BigSis, who never wanted to take dance lessons, LS took to classical Indian dance very naturally. However she treated the dance class just like her gymnastics class and wore what she was comfortable in, which again turns out to be shorts in summers and leggings in winter. I was perfectly fine with it. The dance recital however demands full BharatNatyam regalia with costume, makeup, hair and what not. The costume had to be bought from the school and cost me E-I-G-H-T-Y dollars. A total rip off. And the size is 2 sizes big which means I am begging crafty friends to alter it for me. Then there is makeup. Yeah makeup! I don't wear eye shadows and have two lipsticks in shades like burberry brown that last me for 2 years. So the word "makeup" sends a chill down my spine. "They should wear gold eye shadow", says the dance school, "and red lipstick. Also eyes should be lined with kohl. Don't forget a red bindi for the forehead." The more I hear all these the more I want to grab LS and walk away from this whole dance business. But I have to stay put. Which apparently is not a good idea, as there is hair to be done! LS has short hair and the teacher wants every kid to have their hair tied with garlands wound around it. I mean seriously? What about free spirit and flying hair? Is their no such thing in classical Indian dance? I have a really tough next week what with the dress rehearsal and then the actual recital and all that glittery eye shadow. Keep your fingers crossed so that I live to tell the tale. On a brighter note, I have lots of mint aka pudina growing in my garden this year. Mint has a tendency to spread and grow and the few saplings that I had put down in the ground last year has morphed into a flourishing bush this year. 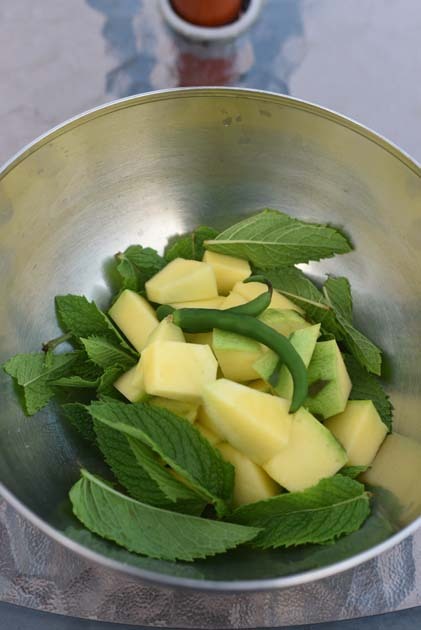 My Mom used to make a aam-pudina chutney with mint and green mangoes in the months of summer. The house help would make the paste in sil-nora, the flat pock marked piece of stone ubiqitious in all Indian homes to grind spices, and the green semi-liquid chutney would be a favorite accompaniment with musurir dal. 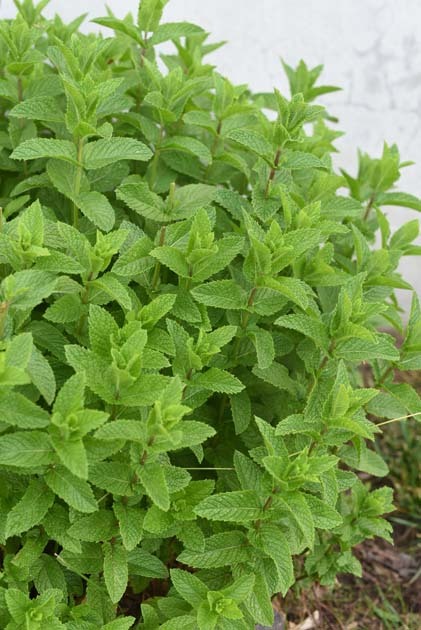 It would be minty, tangy and sweet with a strong summery undertone. Yeah thats a lot of "y". So a friend of mine make this chutney too and recently reminded me of it. 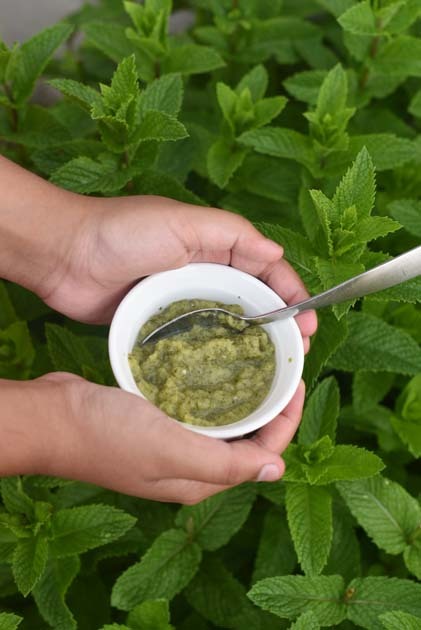 I used a cup of mint leaves, half of a raw mango, two green chillies and made a paste with a splash of water. You can also add some coriander leaves to the mix. I then added sugar and salt to the paste until it tasted just right. If your mango is not too sour add a little lime juice to makeup for the tang. We are using this chaatni in abundance. I put it on top of grilled fish and also made a chicken with it. It is the perfect sauce or chutney for summer. I had written this story sometime last year around Jamai Shoshthi, a day set aside in the month of Jaishtha when Bengali mother-in-law's pamper their son-in-law with food and gifts. I wasn't sure of Sulochana's reaction at the end of this story and so toyed with the idea of this story for a while. It was Jamai Shoshthi two weeks back and I had intended to post this then but never got around. Hope you all like it. The day had dawned stiflingly hot and muggy. Technically it wasn’t even dawn yet. The eastern sky had just turned a shade lighter, a slate grey dhonekhali with few scattered twinkling star work. The seamstress was probably trying a combination of gota-patti on dhonekhali and had decided not to go ahead. Instead she decided on a pale pink border to the slate gray canvas and was working on it right now. Tossing and turning under the cotton mosquito net, which was held together with safety-pins in the couple of odd places where a rent had grown bigger, Sulochana did not think of dawn in those poetic terms. Instead she cursed the fan, which rotated painfully, doing little to move the hot air. She had been asking for an air-conditioner since last summer but nothing had materialized. “No one in this house pays any attention to what I say,” she grumbled to herself, “the day I am gone they will understand my importance”. She was hot and worried about how the day would pan out. But she was also excited. Today was Shoshthi, the sixth day of Shukla Paksha in the month of Jaishtha. Since the day she had married into this house as a bride, she was christened into the rituals of Aranya Shoshthi on this day. When her Mother-in-law was alive, she was the one who spearheaded the celebration, but now it was Sulochana who made sure that the jackfruit branch was cut, the kheer narus made, the haatpakha--palm leaf hand fans and new clothes bought for each of her 3 children and 2 grandchildren. Her grandkids who were here for the summer would make the figurines of shoshthi thakurun with rice flour and then paint them with turmeric and bright water paint. The kids were excited about the Pujo, though her own sons, now middle-aged executives, could care less. “Naah, let me get up now. There is so much work to finish. Montu will soon come with milk for the paayesh, Baroda has to be sent to haat for fresh rui and chingri and if I am late, the neighborhood kids will pluck all flowers and leave the tagor tree bare,” she folded her palms towards the east, bowed to the now pink streaked sky and straightened her sari to get ready for the day. “Thakur, let everything end well today. I have been waiting for this day for five years now,” she threw across these words as a parting shot. Her plea made sense. Sulochana’s 35 year old daughter Tara was coming home today. It had been 5 years since her last visit from USA where she was doing her PhD. All these years she had offered one excuse after another to defer her visit -- visa problem, limited money from the teaching assistantship, not enough vacation, complexity of her thesis which never seemed to get finished. Tara always had an excuse when Sulochana insisted that she come visit them. Deep down Sulochana knew Tara was avoiding her mother and the list of marriage proposals that she would have ready, had Tara managed a visit.But what could Sulochana do? How could she let her only daughter live a lonely life in faraway California, while she led a full house with 2 married sons, their children, a dog and two parrots ? How could she a Mother not pine for the perfect son-in-law for her only daughter ? Today as Sulochana stirred milk in the shiny brass dekchi in her kitchen, her heart fluttered like the tej-patta in the milk both in anticipation and disappointment. Two days ago Tara had called. In a halting voice she had asked if it was okay to bring a guest with her.An American. Her fiance. The news that first seemed like a shock, had now grown familiar to Sulochana. Really, in this day and time when Domino’s delivered pizza to their home even in suburbia of Madhyamgram, an American jamai was nothing to lose one’s sleep over. He sure would be much better than these Bengali boys who think Chicken pomodoro is way better than Kosha murgi. Bolstered by her own belief, Sulochana started to stir the paayesh with more vigor now. She had planned an elaborate meal for lunch, to welcome Tara and her fiance. That today was also Jamai-shoshthi, a day set aside for celebrating son-in-laws in a Bengali family, seemed to her like a divine signal. Unsure of her American guest’s taste, Sulochana had decided to go the traditional route with few modern twists thrown in. A saag bhaja -- green spinach leaves sauteed with garlic and red chilli to start off the meal. Then a dal. 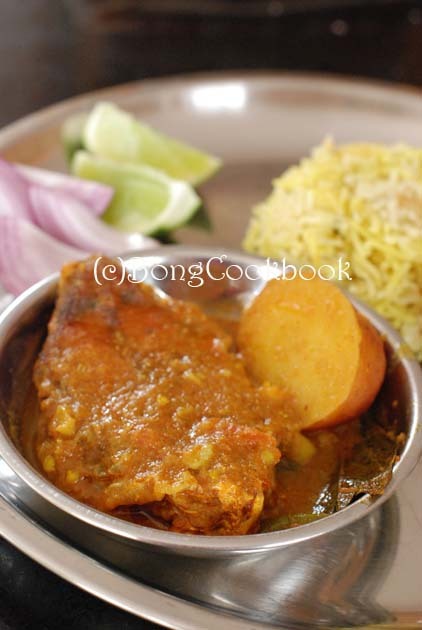 Sulochana had narrowed down on a tetor dal with kaancha moog cooked with cubed pieces of bottlegourd. Bottlegourd was the perfect vegetable for this hot and humid day. Its coolant properties along with antiseptic of bittergourd would be fitting for this visitor from the colder clime. For the fish curry, she skipped the more traditional rui for a chingri today. Maybe a bhapa, large prawns steamed with grated coconut, light and yet flavorful. A kaancha aamer chaatni, with a runny gravy that Tara adored, to round off the meal. And then a aam doi, mango yogurt made with the sweet himsagor from her own tree. 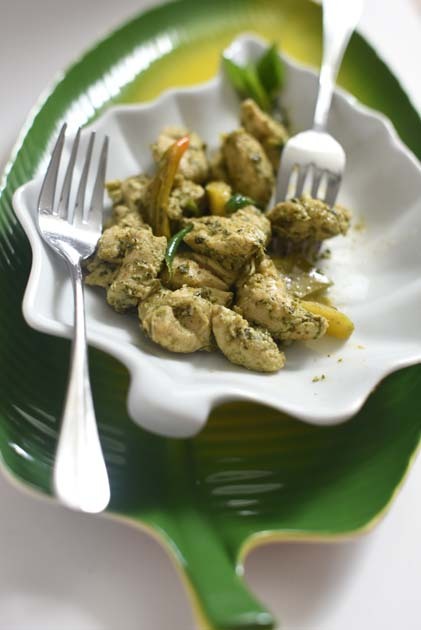 The thought of this menu made Sulochana relax a bit and look forward to the day. “Manu’r Ma, chop the spinach really fine for the saag bhaja. Remember to wash it well. My American jamai is not used to the pesticides we ingest every day,” she instructed her house help. The kitchen grew hotter and fell into a rhythm as the day progressed. The shil-nora crushed spices, the fire blazed the pungent mustard oil, the hefty pieces of fish sizzled in oil.Outside, a lone crow had taken shade in the branches of the mango tree and cawed every few minutes. Sulochana’s fair face glistened with beads of perspiration that had gathered on the crease of her brow. “Ahh, can someone shoo that crow away”, she said irritably. The dal and saag were done, the large prawns would be steamed right before lunch-- that way they would retain their juice and be most flavorful, the yogurt had already been set. She had been fasting since morning, taking only sips of lime water to keep her going. She wanted to finish off her prayers quickly and be ready with all her time on Tara’s arrival. Her husband and sons along with the grandchildren, had already left for the airport to receive Tara’s flight. “Ma, why don’t you take rest, while I make the chaatni,” suggested her younger son’s wife. But today, Sulochana wanted to cook each dish herself. Food was the only way Sulochana knew to express her love and this lunch was going to be a slice of her heart. She wanted to welcome this stranger into her family with an open heart and she would prove to Tara that her love for her daughter’s american husband was to be no less than her own son’s. The pujo for Ma Shoshthi today was done in a hurry. The Goddess would understand. It was already one in the afternoon and Sulochana was getting tired, straining her ears for crunch of wheels on the driveway. Her stomach lurched in anticipation and hunger. Who could it be? She lapsed into moments of day-dreaming while chanting her shlokas. Her mind scanned the Facebook pictures that Tara shared with her brothers. Maybe it was that fair skinned guy with a boyish grin who shared her office at the University. Or was it the slightly older Spanish professor, she raved about? Anyway, there was little for her to do now. The choice had already been made. Right when she raised the shaankh to blow a heralding sound, the car pulled into the driveway. Sulochana’s hand, holding up the shaankh, trembled and with a last bow to her deity, she gathered her red bordered sari and shuffled to her feet. Shrieks of laughter and loud voices could be heard outside. The door to the patio was ajar and her daughter-in-laws were rushing outside with cheerful welcome ringing in their voice. Sulochana arranged the dancing fire of prodeep, few grains of dhaan and the dubbo-- three pronged grass on a brass plate and steadied herself, her heart drumming and waiting for Tara’s high pitched call of “Ma”. “Ma”, a calm composed voice rang behind her. Sulochana whirled around into Tara’s slightly anxious face, her eyes scanning for the stranger, her would be jamai, in the crowd. Tara had a faint smile but her eyes were anxious and defiant at the same time. This was exactly how her Tara was, even as a baby, she was self-willed and would do only what she had set out for. “Ma, meet Sarah,” Tara said and pushed an athletic looking girl in cropped hair and faded jeans to the front. Sarah, not sure if she should hug or do a polite handshake, extended a hand which remained suspended in mid air. At first Sulochana could not fathom what Tara said. She looked around with a puzzled look. Her sons, standing behind Tara, were nodding their head making silent gestures to her. She tried to catch her daughter-in-law’s eyes but they glanced away. The sudden silence was pregnant with all kinds of possibilities which left Sulochana confused. And then she saw Tara’s face and she knew. She could not make much sense of it but Tara’s face had taken on a defiant look and she saw her protective hand around her partner. If Tara is happy, so was she, Sulochana decided. "Bhogoban shobar mongol koruk." She held Sarah’s face between her palms and sprinkled some dhaan on her head, praying for her long life. The pressure cooker whistled in the background. The steamed coconut prawns would be ready in just a few minutes. Yesterday was Author's Day at Little Sis's school. At first I thought it would be one of those days when an author comes to school to read his/her books. Turned out it was a day to celebrate all the little authors in LS's first grade class. The class had a writer's workshop program in first grade where the little guys had learned all about the writing process from mind map,to story web, first drafts, edits and even illustrating a story. Honestly they knew much more about the formal process of writing than I ever did. The teacher also took great pains to publish their story with a proper cover, index and even a dedication page! In addition to this the kids also did journal entries throughout the year. The journals were free writing where the teacher let the kids write anything and everything without any edits. As she said, she knew stuff about us we couldn't even imagine via the journals. 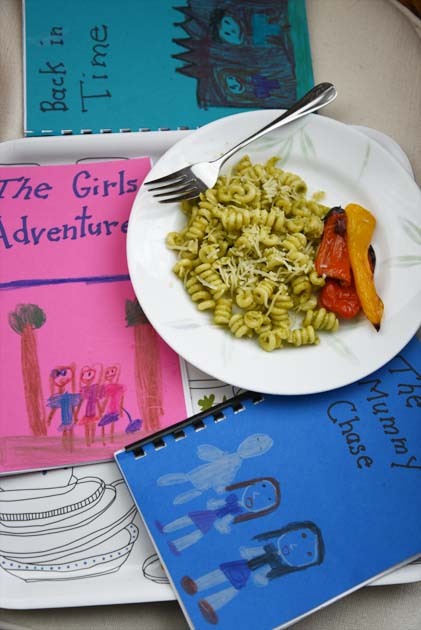 To celebrate all the little authors' work, the parents were invited to join in last Tuesday morning and I am so glad I went. It was such a fun morning hearing about the stories that the kids wrote. I was also very impressed with the teacher who made the whole thing more interesting for the kids, by giving each child an award for their book declaring it to be best in the genre she thought fit. So there were best crime fiction, best magic story, best once-upon-a-time tales and best historical fiction. All the kids had written such interesting books that I really wanted to read all of them. LS had written three books, one of which was about two kids who go to a museum and then get on a time machine to go back to the time of dinosaurs. I am sure she wrote it as an adventure tale but the teacher declared it to be the "best historical fiction". LS was elated with this accolade and is now very proud of her "historical fiction"! Some kids also read from their journal entries and LS read a piece she wrote about "the rickshaw". On our India trip last year, she would pester my Dad to take her on a rickshaw ride almost every day and looks like that was the best thing about our India trip for her. No prizes for guessing why. 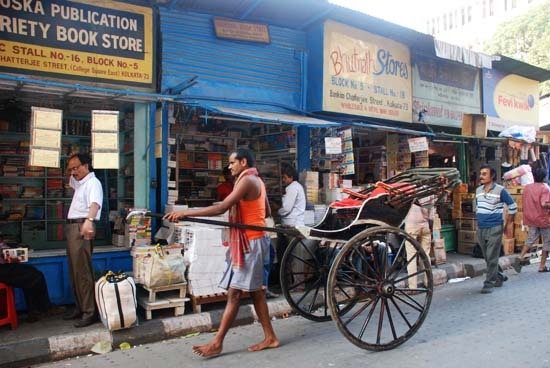 She had written that the rickshaw was like a car without a door or windows and the thing she liked most about the rickshaw was that it didn't have a seat belt. She did not get on the kind of rickshaws shown in the pic though, she was on the ones that are pedaled like a bike. I recorded most of the author's day event and I know I will be watching the recording with much fondness for years to come. It was really an extremely sweet morning where every kid got a chance to be proud of whatever they wrote. Now to this spinach pesto Pasta which I have been making lately as my basil plant is still very very tiny and I have run out of my store bought basil pesto. I usually buy a big box of organic baby spinach from Costco. I saute them in Olive oil and add it to Pasta but last week I decided to make a spinach sauce instead. 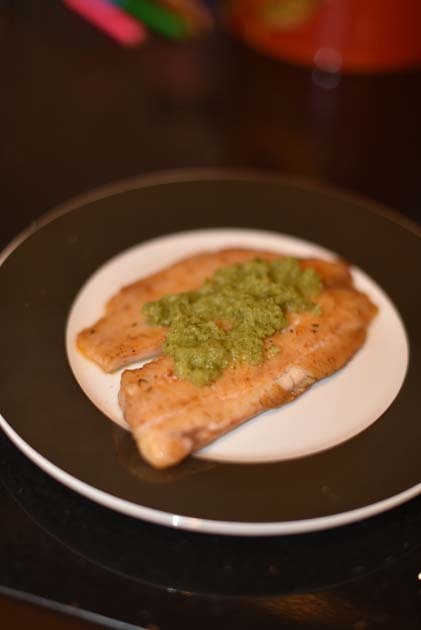 It is a bit different from the usual spinach pesto recipes.This is how you do it. Cook Pasta according to package directions. Drain the Pasta. After draining the pasta I drizzle some olive oil on the Pasta so that they don't get sticky. Now heat some olive oil in a pot big enough where you can also toss the pasta later. Saute until the spinach wilts. Note: You can add some black pepper to kick up the taste but i didn't as LS wouldn't eat it. After the paste is made I also add a little milk to it to make it more creamy. Now in the same pot add some more olive oil and warm. Add the pasta and toss. Add a generous amount of grated Parmesan cheese. This is very important and gives an awesome creamy taste. Toss everything and adjust for salt. Serve. It is yum.